At the core of these issues is the difficulty in defining and measuring software quality. Software Safety now has a blog! Check it out. This site has been listed as the EG3 Editor's Choice in the Embedded Safety category for February 2004.
eCLIPS gives this site four of five stars in the September 7th 2004 SAFETY CRITICAL - DESIGN GUIDE. While I concentrate on Software Safety on this site it is important to note that no software works in isolation. The entire system must be designed to be safe. 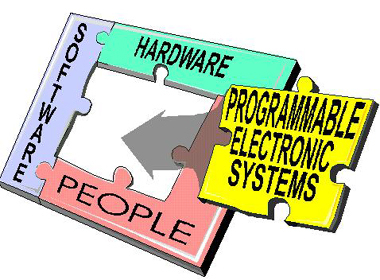 The system contains the software, hardware, the users, and the environment. All must be given consideration when developing software. All parts of the system must be safe. It's getting harder to market safety because newer systems are more likely to be a software program than something visible. "If the system is not visible in action, and is only indicated by a small lamp on the instrument panel, only the smart buyers will understand how important it is," - Fredrik Arp, CEO of Volvo Car Corp. IN EMBEDDED SYSTEMS, SAFETY-CRITICAL IS THE BEST POLICY With the passing of each week, embedded systems become more pervasive and pervasively connected, with even the most remote device dependent to some degree on the reliability and safety-critical operation of other devices or systems. To be sure you are building in the right safety-critical features, read the Technical Insight by David Kalinsky from Enea . It is one thing to know your system is safety-critical; it is another to know how to deal with it. David Kalinsky explains how to evaluate errors, categorize them, and safely handle them when they happen. How do you define Software Quality? Software Quality is not just how many bugs are removed during testing. Customer satisfaction of the software product, as defined by functionality, usability, reliability, performance, instability and serviceability. Customer satisfaction of the software project, as defined by on-time, on-budget and the contracted system requirements. You and I can do better! The FDA's Glossary of Computerized System and Software Development Terminology, defines many of the terms used on this site. Defect: The difference between the expectation and the actual results. Validation and Verification are a set of terms you find when working with Software Safety. Many people do not understand how they differ from each other. Validation: Have we built the correct device? Do we meet the customer's requirements? Verification: Have we built the device correctly? Did we find and remove all of the 'bugs'? Clarifying the distinction between the terms "requirement" and "specification" is important. Requirements are a statement of what the customer wants and needs. Requirements are used for validation. Specifications are the documentation of how the customer requirements are met by the system design. Specifications are used for verification. A requirement can be any need or expectation for a system or for its software. Requirements reflect the stated or implied needs of the customer, and may be market-based, contractual, or statutory, as well as an organization's internal requirements. There can be many different kinds of requirements (e.g., design, functional, implementation, interface, performance, or physical requirements). Software requirements are typically derived from the system requirements for those aspects of system functionality that have been allocated to software. Software requirements are typically stated in functional terms and are defined, refined, and updated as a development project progresses. Success in accurately and completely documenting software requirements is a crucial factor in successful validation of the resulting software. A specification "means any requirement with which a product, process, service, or other activity must conform." (See 21 CFR§820.3(y).) It may refer to or include drawings, patterns, or other relevant documents and usually indicates the means and the criteria whereby conformity with the requirement can be checked. There are many different kinds of written specifications, e.g., system requirements specification, software requirements specification, software design specification, software test specification, software integration specification, etc. All of these documents establish "specified requirements" and are design outputs for which various forms of verification are necessary. Device failure (21 CFR§821.3(d)). A device failure is the failure of a device to perform or function as intended, including any deviations from the device’s performance specifications or intended use. The best introduction to Software Safety comes from the Food and Drug Administration, in their document "General Principles of Software Validation; Final Guidance for Industry and FDA Staff". The FDA's analysis of 3140 medical device recalls conducted between 1992 and 1998 reveals that 242 of them (7.7%) are attributable to software failures. Of those software related recalls, 192 (or 79%) were caused by software defects that were introduced when changes were made to the software after its initial production and distribution. Software validation and other related good software engineering practices discussed in this guid are a principal means of avoiding such defects and resultant recalls. Software quality assurance needs to focus on preventing the introduction of defects into the software development process and not on trying to "test quality into" the software code after it is written. Software testing is very limited in its ability to surface all latent defects in software code. For example, the complexity of most software prevents it from being exhaustively tested. Software testing is a necessary activity. However, in most cases software testing by itself is not sufficient to establish confidence that the software is fit for its intended use. In order to establish that confidence, software developers should use a mixture of methods and techniques to prevent software errors and to detect software errors that do occur. The "best mix" of methods depends on many factors including the development environment, application, size of project, language, and risk. "The major goal of software testing is to discover errors in the software with a secondary goal of building confidence in the proper operation of the software when testing does not discover errors. The conflict between these two goals is apparent when considering a testing process that did not detect any errors. In the absence of other information, this could mean either that the software is high quality or that the testing process is low quality." - Structured Testing: A Testing Methodology Using the Cyclomatic Complexity Metric by Watson and McCabe. "Program testing can be used to show the presence of bugs, but never to show their absence." - Edsger W. Dijkstra; Technological University Eindhoven, The Netherlands. Dijkstra's 1972 Turing Award lecture; it can be obtained as a difficult to read PDF file. "Late Inspection and testing are the simplest, most expensive, and least effective way to find bugs. Before manufacturers adopted modern quality techniques their main approach to removing defects was to inspect each product in the last stage of production once it had been built, but before it was shipped. If the product didn't meet specifications, then it was either reworked or scrapped--both expensive options. Late inspection is prone to human error and rarely finds all defects." -- What Software Development Projects Can Learn from the Quality Revolution By Clarke Ching. B. Beizer in Software Testing Techniques; Van Nostrand Rheinhold, New York, second edition, 1990 , gives an example illustrating an aspect of software complexity concerning the number of paths for a section of code. Given that a section of software has 2 loops, 4 branches, and 8 states, Beizer calculates the number of paths through the code to exceed 8000. To build a case that the software is validated requires time and effort. Preparation for software validation should begin early, i.e., during design and development planning and design input. The final conclusion that the software is validated should be based on evidence collected from planned efforts conducted throughout the software life-cycle. Changes made to correct errors and faults in the software are corrective maintenance. Changes made to the software to improve the performance, maintainability, or other attributes of the software system are perfective maintenance. Software changes to make the software system usable in a changed environment are adaptive maintenance. Do it early in the design cycle! "Writing code is not production, it's not always craftsmanship (though it can be), it's design. Design is that nebulous area where you can add value faster than you add cost." - Joel Spolsky. The Therac-25 incident is the classic example of software done badly. What was the cost of inadequate software engineering practices? Six human casualties. ISO 13485:2003 Medical devices : Quality management systems - Requirements for regulatory purposes. This International Standard specifies requirements for a quality management system that can be used by an organization for the design and development, production, installation and servicing of medical devices, and the design, development, and provision of related services. It can also be used by internal and external parties, including certification bodies, to assess the organization's ability to meet customer and regulatory requirements. I want to thank John J. Sammarco from the NIOSH Pittsburgh Research Laboratory branch for his permission to quote from the presentation slides he provided, from the workshop "Programmable Electronic Mining Systems: An Introduction to Safety"; August of 1999. Functional and operational safety starts at the system level. Safety cannot be assured if efforts are focused only on software. The software can be totally free of 'bugs' and employ numerous safety features, yet the equipment can be unsafe because of how the software and all the other parts interact in the system. In other words, the sum can be less safe than the individual parts! Thus, a system approach is needed. How does one address the safety of this system? Is it done by making the system more reliable, employing redundancy, or conducting extensive testing? All of these are necessary but not sufficient to ensure safety! Making a system more reliable is not sufficient if the system has unsafe functions. What you could have is a system that reliably functions to cause unsafe conditions! Employing redundancy is not sufficient if both redundant parts are not safe. Testing alone is not sufficient for safety. Studies show that testing doesn't find all the 'bugs' and some systems are too complex to test every condition. The key to safety is to 'design in' safety early in the design by looking at the entire system, identifying hazards, designing to eliminate or reduce hazards, and doing this approach over the system life cycle! Depending on which study was being quoted in the Workshop, forty to eighty percent of all system failures are caused by project management! Most causes of system faults are created before the first line of code is written, or first schematic is drawn. The errors are caused by not understanding the requirements of the system. One simple way of understanding the requirements is to ask yourself how you would test this requirement. If you can not specify a test that can clearly show the requirement has been met, then the requirement or the understanding needs refinement. Just do a lot of testing Just make the software "safe"
The earlier in the design cycle that the requirements are clearly understood the lower the cost of any needed changes. (i) each safety-related function to be implemented? (ii) the information to be given to the operator at any time? (iii) the required action on each operator command including illegal or unexpected commands? (iv) the communications requirements between the embedded system and other equipment? (v) the initial states for all internal variables and external interfaces? (viii) the anticipated ranges of input variables and the required action on out-of range variables? (ix) the required performance in terms of speed, accuracy, and precision? (xi) internal self-checks to be carried out and the action on detection of a failure? Does the software contain adequate error detection facilities allied to error containment, recovery, or safe shutdown procedures? Are safety critical areas of the software identified? While you are probably not designing coal mining equipment, the documents of the System Safety Evaluation Program give you the procedures that you need to design a safe system. These guidelines are based on industry standards such as IEC 61508, and UL 1998. You can download the System Safety Evaluation Program guidelines for free, unlike IEC 61508 and UL 1998, to learn what is required to design a safe system. "As a result of a number of accidents and incidents involving mining machinery utilizing programmable electronics, MSHA and the National Institute for Occupational Safety and Health (NIOSH) have entered into a joint effort and developed a set of recommendation documents for addressing the functional safety of programmable electronics for mining. The recommendations are organized to form a risk-based safety framework, based on a system safety process, that considers the interfaces and interaction between the mining machinery hardware, software, human interface, and the operating environment for the equipment's full life cycle. The equipment's life cycle includes the stages of design, certification, commissioning, operation, maintenance and decommissioning. These recommendation documents are intended to provide assistance to manufacturers and end users of complex mining equipment incorporating programmable electronics in addressing hazards associated with the design, operation and maintenance of their equipment. Equipment applications where these recommendations are applicable and where a number of accidents and incidents have occurred include remote controlled mining equipment, and longwall mining systems." I participate in the System Safety Evaluation Program committee as a representative of industry. I wrote an introduction to the System Safety Evaluation Program for Circuit Cellar Magazine a few years ago, you can read it here. Dave Reynolds, VP of marketing for MTL, sums up the importance applying system safety guide lines, in MINING Magazine - September 2002, Volume 187, No.3. "There are many potential users of the IEC 61508 who are not completely aware of the full implications of the standard," according to Dave Reynolds, VP of marketing for MTL. "Instrumented safety systems have typically been designed to established practice within a specific company," Reynolds explained. "The benefits of the IEC 61508 standard for users include applying a scientific approach to specifying and designing safety systems, quantifying risk and an appropriate protective system, clearly demonstrating the suitability of products that meet the standard, and allowing users to potentially save money by eliminating under- or over-specification of system components." MTL, a leader in intrinsically safe, process I/O products, has launched its new Safety Related (-SR) Series of products to allow customers to take advantage of the IEC 61508 standard. MTL's -SR products meet IEC 61508 standard. DILBERT: © Scott Adams/Dist. by United Features Syndicate, Inc. This Dilbert Moment has been reproduced here with permission, it may not be reproduced elsewhere without permission. "80% of all embedded systems are delivered late, often hopelessly bug-ridden. "For my money the most important work on software productivity in the last 20 years is DeMarco and Lister's Peopleware (1987 Dorset House Publishing, NY NY). For a decade the authors conducted coding wars at a number of different companies, pitting teams against each other on a standard set of software problems. The results showed that, using any measure of performance (speed, defects, etc.) the average of those in the 1st quartile outperformed the average in the 4th quartile by a factor of 2.6. Surprisingly, none of the factors you'd expect to matter correlated to the best and worst performers. Even experience mattered little, as long as the programmers had been working for at least 6 months. They did find a very strong correlation between the office environment and team performance. Needless interruptions yielded poor performance. The best teams had private (read "quiet") offices and phones with "off" switches. Their study suggests that quiet time saves vast amounts of money. Think about this. The almost minor tweak of getting some quiet time can, according to their data, multiply your productivity by 260%! That's an astonishing result. For the same salary your boss pays you now, he'd get essentially 2.6 of you." Peopleware: Productive Projects and Teams by Kirby Cartwright , in Book Reviews at freshmeat.net also recommends Peopleware . The major insights that DeMarco and Lister give after an enjoyable hour or so of reading is a list of ways to prevent teams from successfully forming and performing their (software development) task and a series of anecdotes that probably illustrate what you already know about how software development and corporations work. In Chapter 3 (Vienna Waits for You): "There Ain't No Such Thing as Overtime". Marco and Lister suggest a push-me pull-me type of effect. After an extended period of uncompensated overtime, a person will either slack off greatly or, if continuing to work, will start working backwards from fatigue. Any logical engineer knows interruptions are one of the most effective productivity killers around. 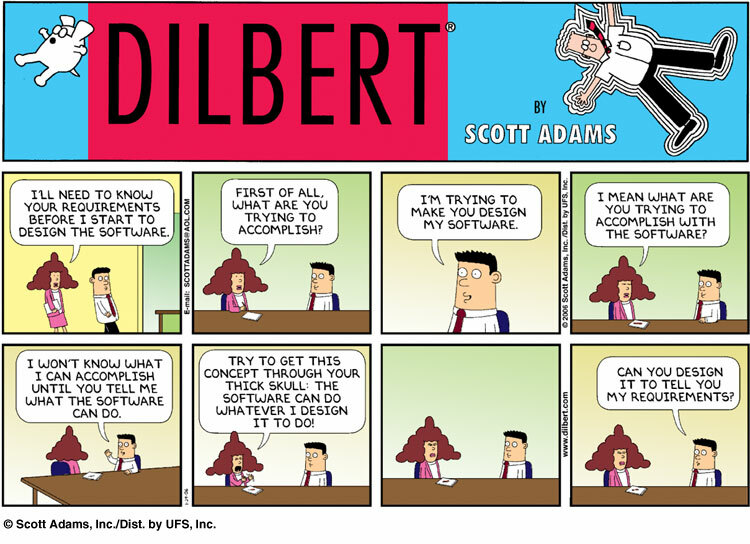 Removing cement brick walls, some thing right out of a Dilbert Cartoon , "To improve communication between staff members" is not the way to create better software and products. Anti-Productivity Pods: Cubicles as Dilbert so astutely noted. There is a killer technique to reduce bugs and get to market much faster. Jack's A Guide to Code Inspections shows how. Keep in mind that peer reviews are as much a social interaction as a technical practice. Asking your colleagues to point out errors in your work is a learned - not instinctive - behavior. Firmware basics for the boss, part one. "Version control First, before even thinking about building any sort of software, install and have your people use a version control system (VCS). Building even the smallest project without a VCS is a waste of time and an exercise in futility." Version Control is the foundation for good software, without that foundation there is little point in trying to do other software quality improvement techniques. Firmware basics for the boss, part two. "A poll on Embedded.com suggests 85% of companies won't spend more than $1,000 on any but the most essential tools. Considering the $100k+ loaded cost of a single engineer, it's nuts to not spend a few grand on a tool that offers even a small productivity boost." What does it mean for a system to be safe? answer this question by defining safety in terms of achievable system goals, and then arguing that a system has been developed in such a way that it meets those goals. The development of safety critical systems is guided by standards. Many standards require the development of a safety case to demonstrate the acceptability of Safety Critical Systems. The safety case must provide confidence that the system is deemed safe enough to operate. 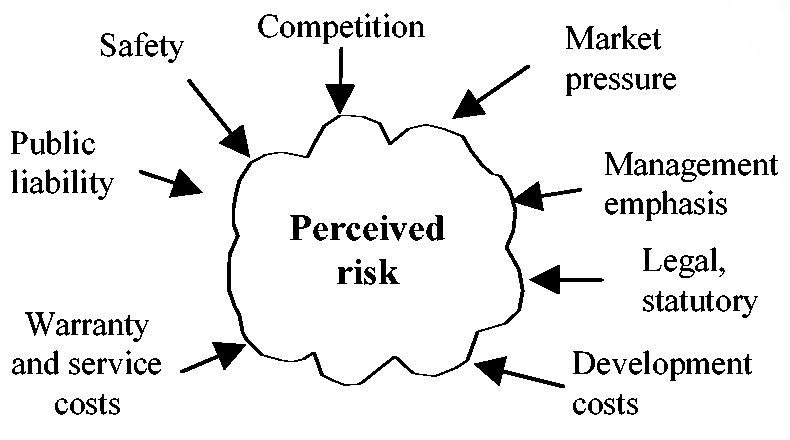 For system components where it is not possible to quantify the associated risks (e.g. software), current standards in the aerospace, rail and defence sectors identify design and safety processes for different Safety Integrity Levels (SILs) or Development Assurance Levels (DALs). The assumption is that components developed against the requirements of higher SILs/DALs will be less prone to critical failures and thus have a lower impact on the safety of the overall system. Research has shown that this assumption is questionable, and instead is possible to consider assurance of the safety argument as a method of demonstrating the confidence that can be placed in a safety case. The aim of the safety argument within a safety case is to clearly demonstrate how the evidence meets the safety requirements. It is possible to build both strong and weak safety arguments, and this strength is based upon the extent to which the safety requirements have been satisfied by the evidence. Safety Assurance Levels (SALs) articulate the judgements made by argument developers about the relevance of individual items of evidence and the completeness of the evidence set. The Goal Structuring Notation (GSN) is a graphical argumentation notation explicitly represents the individual elements of any safety argument (requirements, claims, evidence and context) and (perhaps more significantly) the relationships that exist between these elements (i.e. how individual requirements are supported by specific claims, how claims are supported by evidence and the assumed context that is defined for the argument). The following is from Software Development's magazine 6th issue of SD People & Projects email newsletter. Excerpts from the article "Leading Geeks" reprinted here with the permission of Amit Asaravala. If you've ever given what you thought was an incredibly passionate speech to a roomful of unmoved, unblinking developers, you can take solace in knowing that you're not alone. Indeed, C2 Consulting's Paul Glen has seen so many similar scenarios throughout his years as a management adviser that he felt compelled to write a book about them. Leading Geeks (Jossey-Bass, 2002) does not spend all 253 of its pages examining uncomfortable silences in meetings, but it does offer plenty of insight about why working with developers is different than working with, say, your sales staff (a group of people much more likely to jump out of their seats and give high-fives all around after your big speech). First, developers are different from other employees. Among those who choose to become developers, there are common patterns of behavior, attitudes and values. These patterns influence how one should lead. For example, developers tend to be more loyal to their technology than to their company or even project. For most, the technology draws them to a career in development, rather than an attachment to some specific industry. Developers also tend to have what I call the "passion for reason," a strong sense that all things are or should be completely rational rather than emotional. So if you're trying to motivate a group of developers to go out and work hard, the emotional, whip-up-the-passion approach so common in sales organizations usually falls flat. Secondly, development work is fundamentally different from other work. This form of creative work does not conform to the manufacturing model that most management theories advocate. What you would lead someone to do significantly affects how you should lead them. Here, the inherent ambiguity of technical work makes traditional leadership quite hard to do. Since most leaders think that their job is to tell people what to do, they become quite frustrated by technical projects, where one of the biggest jobs is to figure out what to do. In development projects, figuring out what to do is often harder than doing it. And finally, power is useless with developers. This is not because developers are recalcitrant, but because power is about influencing behavior. But developers deliver most of their value through their thoughts, not their behavior. Traditional approaches to leadership are based largely on notions of power and aren't particularly useful when it comes to developers. Examining the reasons for these failures, one discovers that the majority of projects fail not due to technical problems, but due to difficulties in leadership, management, client relationships and teamwork. In short, human problems doom projects, not technical ones. What tends to motivate developers most of all is engaging work, the opportunity to learn new things, fair pay and the prospect of a future filled with more of the same. Since I played a small part in the production of "MicroC/OS-II The Real-Time Kernel; A complete portable, ROMable scalable preemptive RTOS", first edition, ISBN: 0-87930-543-6, Copyright 1999; my name is on page XIX of the book. I found of particular interest that µC/OS-II is being used in Safety Critical Systems. Validation and Verification suites are being produced by Validated Software Corp.
MicroC/OS-II Validation Suite: A complete RTCA/DO-178B or ED-12B suite of design documents, test documents, structural coverage tests, and supporting documentation for full FAA/JAA certification compliance up to Level A.
MicroC/OS-II Verification Suite: A complete set of tests for qualifying the integration of MicroC/OS-II components based upon Validated’s FAA RTCA/DO-178B certification Validation Suite tests. You can find information about the FAA Aircraft Certification Service's software programs, policy, guidance and training at this web-site. It is particularly focused on software that has an effect on the airborne product (a "product" is an aircraft, an engine, or a propeller). The Aircraft Certification Service is concerned with the approval of software for airborne systems (e.g., autopilots, flight controls, engine controls), as well as software used to produce, test, or manufacture equipment to be installed on airborne products. Note: DO-178B is not available for download. For information on obtaining a copy of DO-178B visit the Radio Technical Commission for Aeronautics (RTCA) web-site at http://www.rtca.org. An Introduction to DO-178B may be found at the Birds Project page. The Birds Project provides free software intended to make it easier to develop airborne software. There you can find Do178Builder . Do178Builder is a free software tool which helps to structure the software-development effort in such a way that documentation -- and particularly DO-178B documentation -- is a natural product of the project rather than a time-consuming after-thought. Versions of Do178Builder exist for Win32 and for Linux. Source-code is provided, so it may be possible to compile it for other platforms as well. Do178Builder is tailored for production of DO-178B documentation, but is not limited to that use. DO-178B forces one to ask (and answer) many questions about the development effort, and this is valuable regardless of whether the software is targeted for airborne use or not. The answers to the questions are useful documentation. Policy Statement on Guidance for Determination of System, Hardware, and Software Development Assurance Levels on Transport Category Airplanes . Summary: The purpose of this memorandum is to clarify Federal Aviation Administration (FAA) Transport Airplane Directorate (TAD) certification policy on determination of system development assurance levels, hardware design assurance levels, and software levels. Many of us have been given a project where the only requirement given was the delivery date. Leaving us to guess and waste a lot of time as to what the customer really wanted. The key to software quality lies in getting the right requirements and getting the requirements right. I can not stress it enough: Requirements form the foundation for all the software work that follows. Arriving at a shared vision of the product to be developed is one of the greatest challenges facing the software project team, and customer involvement is among the most critical factors in software quality. Without their "buy-in" throughout the project life-cycle, they will find every reason not to use the system, and the project will incur un-needed costs just to ease their complaints. Software Stakeholder Management - It's not all it's coded up to be [PDF] (Presented at 13th Annual International Conference on Software Quality and Pacific Northwest Software Conference 2003) - By Robin Dudash. The following is taken from Software Development's Agile Modeling Newsletter July 2003 By Scott W. Ambler . It is reproduced here with the permission of the editor Alexandra Weber Morales. 1. "Active stakeholder participation is crucial." Project stakeholders must be available to provide requirements, to prioritize them, and to make decisions in a timely manner. It's critical that your project stakeholders understand this concept and are committed to it from the beginning of any project. 2. "Software must be based on requirements." If there are no requirements, you have nothing to build. The goal of software development is to build working software that meets the needs of your project stakeholders. If you do not know what those needs are, you can't possibly succeed. 3. "Nothing should be built that doesn't satisfy a requirement." Your system should be based on the requirements, the whole requirements, and nothing but the requirements. 4. "The goal is mutual understanding, not documentation." The fundamental aim of the requirements-gathering process is to understand what your project stakeholders want. Whether or not you create a detailed document describing those requirements, or perhaps just a collection of hand-drawn sketches and notes, is a completely different issue. 5. "Requirements come from stakeholders, not developers." Project stakeholders are the only official source of requirements. Yes, developers can suggest requirements, but stakeholders need to adopt those suggestions. 6. "Use your stakeholders' terminology." Don't force artificial, technical jargon onto your project stakeholders. They're the ones doing the modeling -- and the ones the system is being built for -- therefore, you should use their terminology to model the system. 7. "Publicly display models." Models are important communication channels, but they work only if people can actually see -- and understand -- them. I'm a firm believer in putting models, even if they're just sketches or collections of index cards, in public view where everyone can access and work on them. 8. "Requirements change over time." People often don't know what they want -- and if they do, they usually don't know how to communicate it well. Furthermore, people change their minds -- it's quite common to hear stakeholders say, "Now that I think about this some more ..." or "This really isn't what I meant." Worse yet, the external environment changes -- perhaps your competitors announce a new strategy, or the government releases new legislation. Effective developers accept the fact that change happens and, better yet, they embrace it. 9. "Requirements must be prioritized." Stakeholders must prioritize the requirements, enabling you to constantly work on the most important ones and thus provide the most value for their IT investment. 10. "Requirements only need to be good enough." Not perfect? But you'll build the wrong thing! Agile developers don't need a perfect requirements specification, nor do they need a complete one, because they have access to their stakeholders. Not sure what a requirement means, because there isn't enough detail? Talk with your stakeholders and have them explain it; if they can't explain it, keep talking. 11. "Use simple, inclusive tools and techniques." It's possible, and in fact desirable, for stakeholders to be actively involved in modeling. However, stakeholders typically aren't trained in modeling techniques, nor complex modeling tools. Although one option is to invest several months to train your stakeholders in modeling tools and techniques, a much easier approach is to use simple tools, like whiteboards and paper, and simple modeling techniques. Simple tools and techniques are easy to teach and are therefore inclusive because anyone can work with them. Don't scare people with technology if it's not needed! 12. "You'll still need to explain the techniques -- even the simple ones." Because people learn best by doing, it's often a good idea to lead stakeholders through the creation of several examples. 13. "Most requirements should be technology independent." I cringe when I hear terms such as "object-oriented", "structured" or "component-based" requirements. These terms are all categories of implementation technologies and therefore reflect architectural and design issues. 14. "Some requirements are technical." It's important to recognize that some requirements, such as the technical constraint that your system must use the standard J2EE and relational database technologies employed within your organization, are in fact technology dependent. Your stakeholders should understand when this is applicable, and why. 15. "You need multiple models." The requirements for a system are typically complex, dealing with a wide variety of issues. Because every model has its strengths and weaknesses, no one single model is sufficient; therefore you'll need several types of models to get the job done. 16. "You need only a subset of the models." When you fix something at home, you'll use only a few of the tools in your tool box, such as a screwdriver and a wrench. The next time you fix something, you may use different tools. Even though you have multiple tools available, you won't use them all at any given time. It's the same thing with software development: Although you have several techniques in your "intellectual toolbox," you'll use only a subset on any given project. 17. "The underlying process determines some artifacts." Different methodologies require different requirements artifacts. For example, the Rational Unified Process and Enterprise Unified Process both require use cases, Extreme Programming requires user stories and Feature-Driven Development requires features. 18. "Take a breadth-first approach." It's better to first paint a wide swath to try to get a feel for the bigger picture, than to focus narrowly on one small aspect of the system. By taking a breadth-first approach, you quickly gain an overall understanding of the system, and you can still dive into the details when appropriate. Taking an Agile Model-Driven Development approach, you gain this broad understanding as part of your initial modeling efforts during "Cycle 0." 19. "Start at your enterprise business model." Some organizations have what's called an enterprise business model that reflects their high-level business requirements. If your organization has one, and it's current, it's a perfect starting place to understand both your organization and how your system fits the overall picture. You should be able to identify which high-level requirements your system will (perhaps partially) fulfill; otherwise, it's a clear sign that either the model is out-of-date or it's not necessary in your organization. This column was drawn from Chapter 4 of [Scott W. Ambler's] forthcoming book, The Object Primer, 3rd Edition: Agile Model Driven Development with UML 2 (Cambridge University Press, January 2004). All of the practices on this site are the starting points for structuring and deploying an effective process for managing software development and maintenance. They may be tailored to the particular culture, environment, and program phases of a program. Of course, these practices cannot help "death march" programs that are expected to deliver under impossible schedule deadlines, with inadequate funding, and without the required staffing with essential skills. If you can not get full and visible commitment from the highest levels of the company's management, then initiate and implement process improvement changes within your sphere of influence. Do you have any ideas that you would like to contribute? Select from the menu other areas of Software Safety that you would like to explore. Go Back To The Software Safety Home Page.